For Summit (Ore.) High School’s Carol McLatchie and Dakota Ridge (Colo.) High School’s Mark Stenbeck, those instances might have come at different junctures, but they led to the same place: Being named the 2018 National High School Cross Country Coaches of the Year by the U.S. Track & Field and Cross Country Coaches Association (USTFCCCA) on Thursday. Stenbeck became fully aware of his team’s potential at the Dave Sanders Invitational in late September. Up until that point, his boys had never beaten perennial power Mountain Vista High School head-to-head in any setting (dual meet/invitational/etc.) – but there was a special feeling in the air that day. The Eagles didn’t just defeat their rival on September 21: They crushed them. Dakota Ridge put five runners across the finish line before three Golden Eagles completed the 5K circuit and totaled 34 points to win the meet title by 41 points (Mountain Vista finished runner-up). It’s safe to say Dakota Ridge rode that wave of confidence all the way to Nike Cross Nationals (NXN). The Eagles won team titles at the Jeffco League Championships, the Colorado Class 5A Region 2 Championships and the CHSAA Class 5A state title by scoring an average of 34 points and then captured the team title at the NXN Southwest Regional Championships with 107 points. Dakota Ridge, then competing as “Littleton” at the Glendover Golf Course for NXN, placed third behind an all-time effort by Loudoun Valley (Purcellville) and just one point behind Great Oaks (Temecula), the runner-up. 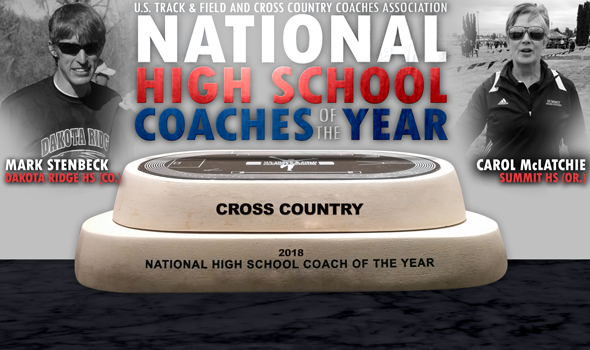 Both of those programs are coached by former National High School Boys Cross Country Coaches of the Year: Marc Hunter (2017) and Doug Soles (2015). It should be noted that the Eagles were the only program with two runners in the top-30. Then with national glory on the line, Summit would not be denied. The Storm might have trailed by 42 points at the 1 mile split, but they surged into the lead by 16 points at the 2 mile mark and eventually won by 66 points, becoming the first West Coast girls’ program to reign at NXN.